Membership of the Association is open to anyone with an interest in the Sackett family history. The only requirements for membership are an interest in Sackett family history and a willingness to share research findings with other members. There are no fees for membership. The rules of the Association are in the Constitution. help run the Association by seeking election to the Committee. 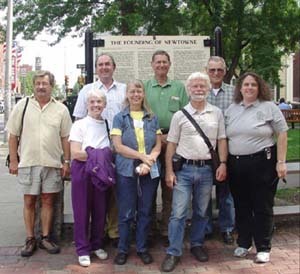 Members have their own web page in the members' register with links to their Sackett ancestors' pages. The Sackett family mailing list is the main forum for the exchange of research findings and the posting of queries about Sackett family history and genealogy. Association members are automatically subscribed (free) to the list. List Administrator Terri Carlson will be pleased to help with any subscription matters. Pictures are linked to members' pages. Voting in this year's election of members to TSFA Committee closed on 30 April. Glenna Hertzler, Liesa Robarge, and Ted Smith were elected unopposed for a three-year term, forming the class of 2021. Sharon Powalka was elected unopposed for a one-year term in the class of 2019.